Why is it that even the most basic concepts are misunderstood in the field of autism intervention? I can understand why the media can’t get it right, but I am always surprised when Autism Speaks can’t get it right! As I mentioned previously, for most of us it is obvious that the Apps designed for an iPad are not stand alone therapies! The Ipad is simply a better way for children to access what they were already using. It’s analogous to a typist switching from an IBM Selectric to a computer which is faster and, therefore, much more efficient. Let’s take a few examples: in the case of the iPad, if a child is accustomed to using icons, and now the icons are on the iPad instead of velcroed onto a bulky-looking sheet of paper in a three ring binder, the icons may be more effective since they are faster to use; however, the basic idea is the same (with the improvement that the child is not stigmatized by a big, clunky, binder). Another example: if a teacher uses the iPad to have the child trace letters with his finger rather than on a sheet of paper, that is certainly more efficient; the teacher is simply using new technology on tried and tested old techniques. A final example is teaching using flashcards: the iPad may have a bigger, better, more vibrant library of flash cards that can be used to teach labels; however, it is still the science-based, discrete trial training that is being used to work with the child on labels. The iPad, used properly, is a godsend for children with autism! 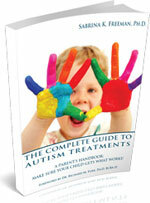 Autism Speaks shouldn’t worry: we parents are certainly smart enough to figure this one out!